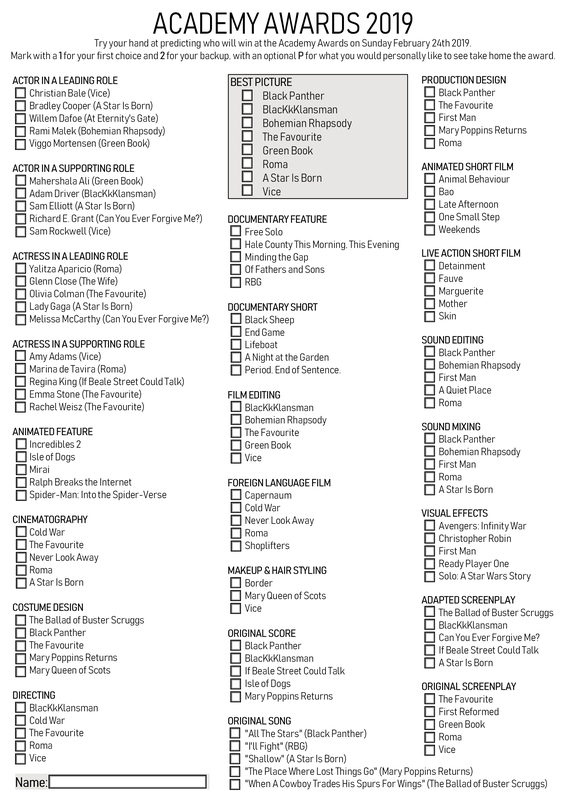 Here’s my printable Oscar Ballot Sheet for this year’s nominees, due to be awarded on Sunday, February 24th 2019. I’ve seen a few of the films so far, though I hope to improve on that over the coming fortnight and will update my site with as many reviews as I can find the time to do. Download the PDF here or as an image file by clicking on that thumbnail. Have a go at predicting this year’s winners and why not challenge your friends and family to do the same. I use the system of 1. for my first choice of who I think will most likely win, 2. for a backup choice of who could win it if not the favourite, and P. for my personal choice of who I’d vote for. These can then be scored as 2 points for a correct first choice and 1 point for a second choice, no points are awarded for personal picks. I’ll post my predictions a few days before the little gold men are given out on Sunday, February 24th 2019. You can also download the full Oscar Watchlist 2019 with all the films nominated this year, listed with details of where they are available to be seen so you can work your way through them too.